A flyer for a Sherlock Hack that gathered storytellers, game designers, makers and hackers in the fall of 2016 to design and build a massive connected crime scene at Lincoln Center. 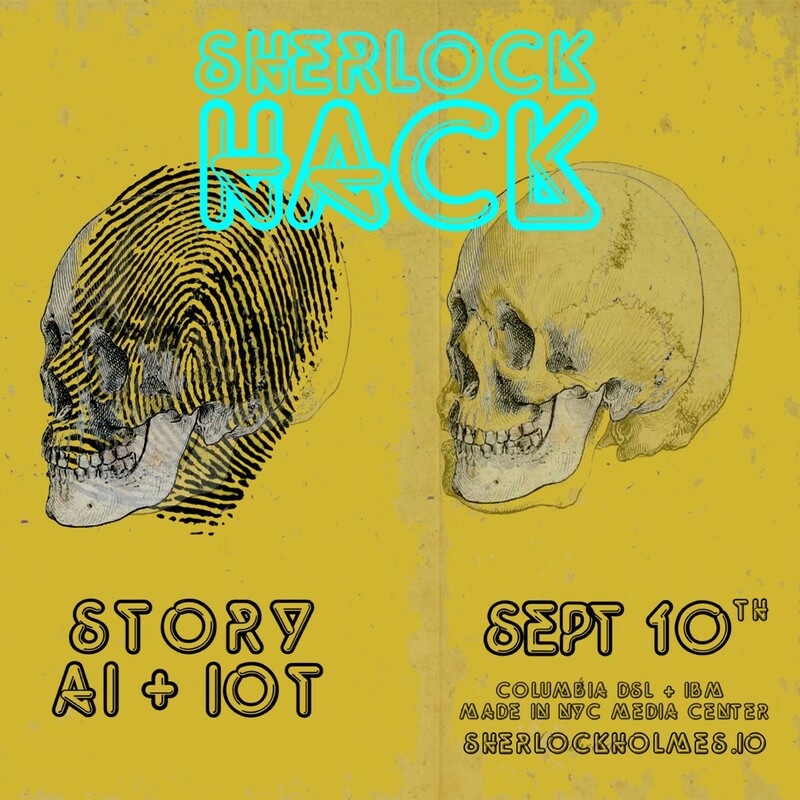 Project Description: Sherlock Holmes & the Internet of Things is an ongoing prototype developed and run by the Columbia University Digital Storytelling Lab that explores new forms and functions of storytelling. Designed to be an open R&D space (released under a creative commons license) that experiments with shifts in authorship and ownership of stories, the massive collaboration also uses a detective narrative to examine the policy and ethical issues surrounding the Internet of Things and emergent technologies. On one hand Sherlock Holmes and the Internet of Things is a collaborative storytelling game. On the other it is an exploration of how the devices that make up our increasingly connected world can be used to do that most human of things: tell stories… As the line between the real world and the digital continues to blur methods of navigating that divide are going to become more important. What better way is there to lay a foundation for those kinds of negotiations than through play? 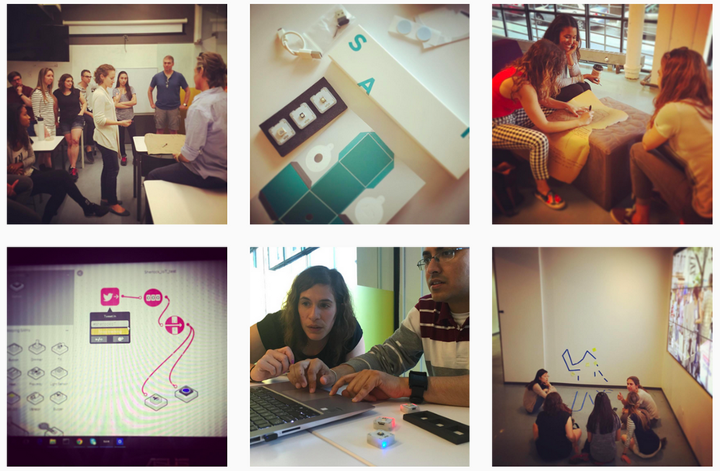 In the fall of 2014 we launched an ambitious collaborative storytelling experiment with an impromptu gathering of storytellers, game designers, makers and hackers. 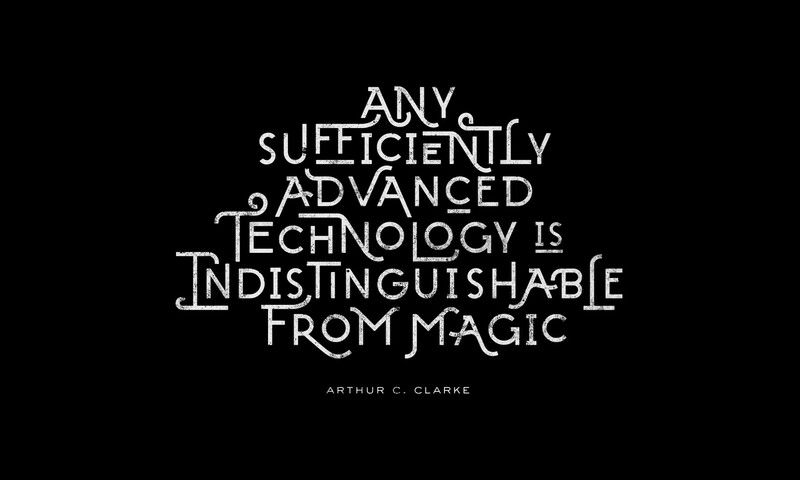 Initially it all started with a simple mashup of two things that ignited our imaginations — “Sherlock Holmes” & “the Internet of Things.” At that point in time a large number of works by Arthur Conan Doyle, the creator of Sherlock Holmes, had just entered the public domain. Meanwhile the buzz of IoT, with its promise of everything rapidly connecting to the cloud, had experienced numerous fits and starts. However Google’s acquisition of Nest (a smart thermostat company) for $3.2 billion in cash put IoT front and center in 2014. Overtime Nest would come crashing back to earth as changes in leadership and struggles to evolve within Google continue to prove difficult for both companies. The Internet of Things like many emergent technologies struggles to find meaning within the marketplace. While IoT points to a strange Harry Potterfication of the world where everyday objects take on seemingly magical powers, it is difficult for us to fully understand how the technology can bring true value to our lives. However the notion that objects could become enchanted thus enabling narrative to spill off screens and into the real-world presents a unique opportunity to explore a 21st Century adaptation of Sherlock Holmes. Doyle himself was making sense of new emergent technologies and processes such as ballistics, fingerprints, blood testing and non-contaminated crime scenes as he serialized the trials and tribulations of Holmes and Watson. In fact his fiction introduced and helped popularize numerous techniques that informed the cornerstone of forensics that we depend on today. What if by examining the works of Sherlock Holmes we could gain a better understanding of the emergent technology that surrounds us today? Over the last 2 1/2 years Sherlock Holmes & the Internet of Things has grown to over 2,500 collaborators in 60+ countries. The project has forked numerous times as participants have built upon its foundation in an effort to create projects, programs and prototypes. From immersive storytelling experiences to escape the room games to VR and AR apps to enchanted objects powered by IoT to educational programs — Sherlock Holmes and the Internet of Things has helped to establish the space for a massive online/offline collaboration. Since 2015 there have been more than 150 self-organized events around the world. Released under a Creative Commons International 4.0 sharealike/commercial license, participants are welcome to experiment and explore the possibilities of story-driven innovation. The project leans into the notion of a “fuzzy collaboration” creating a space that encourages those participating to embrace ambiguity as they design, create, build and test a series of prototypes. At its core Sherlock Holmes & the Internet of Things is about exploring questions and possibilities. How can storytelling and play be harnessed as a tool for change? What does it take to design and build adaptive learning environments that are reflective of the 21st Century? How can you scale global collaborations while leaving room for individual and team contributions? The many layers to the project attempt to embrace a systems thinking approach to explore shifts in the authorship and ownership of stories, the ethical and political issues of emergent technologies as well as the challenges associated with documenting and sharing our collective findings. 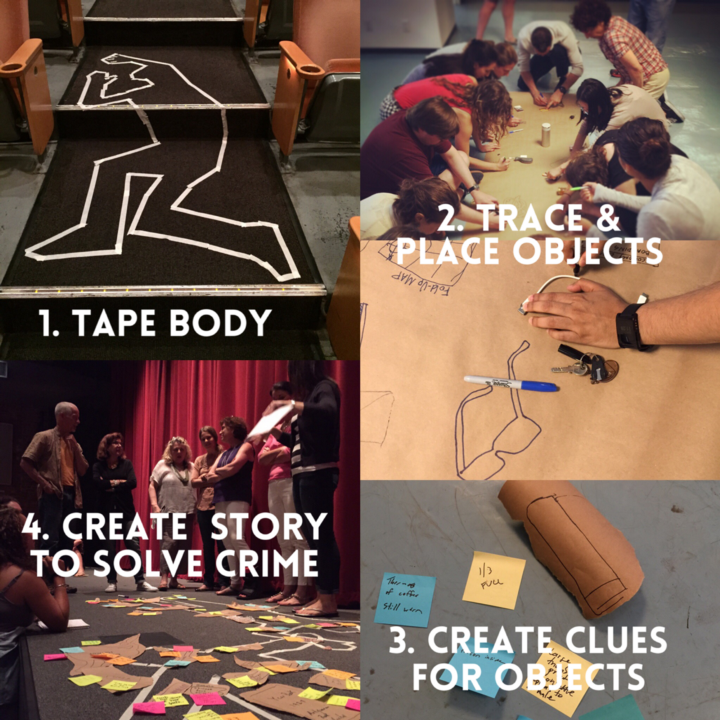 When we started developing the Sherlock experience for Lincoln Center we thought that we’d craft the story, place the objects/clues and establish the crime scenes. Our initial thought was that participants would take on the role of Sherlock and Watson. What we soon discovered thanks to a series of analog prototypes was that we were completely wrong. Engagement levels and most importantly the FUN factor greatly increased as we relinquished control and let those formerly known as the “audience” become collaborators with us. Together we are all storytellers wrestling with an emergent creative space one in which our collective actions give rise to a new narrative that embraces the collaboration itself. Throughout the process we have utilized the EDIT framework which builds upon design thinking, narrative design, and game mechanics. We’ve moved through the four stages of EDIT (empathy, define, ideate and test) numerous times. We’ve spent many hours with the “why” of the experience all in an effort to see where what we’re designing/building breaks and where it doesn’t. By establishing a design question and a series of design principles we’ve been able to create a foundation for our team’s collaboration. Meanwhile a common understanding and shared vision has emerged over time. How could we harness technology to evoke empathy and emotion, while at the same time enabling an intuitive, invisible and fluid storytelling experience for the audience in order to empower them to become fellow collaborators? Not only are the core design principles guiding our development process for Lincoln Center, they are helping to inform and shape the collaborative experience surrounding the MOOC itself. The Trace — The user can see their contributions within the story. Granting Agency — The user is granted agency to make decisions (as a team and individually) and they can identify how their actions impacted the experience. Thematic Frame — The user can contribute to the experience because they have a pre-existing understanding of its foundation. Social Movement / Serendipity Management — Orchestrated micro experiences where unexpected moments foster collaboration between participants. Starting in the Spring of 2017 teams from around the world will ideate, design and prototype a 21st Century adaption of Sherlock Holmes that embraces a set of core principles. A prototype could be a game, an immersive storytelling experience, an enchanted object powered by IoT, a sherlock AI bot, an AR or VR project, a learning program for youth and/or an experience that makes social impact. The choice is up to you. Everyone is welcome and this year we’re experimenting with an open door policy. What that means is you can drop into the experience at any point. To find out more checkout this quickstart guide.